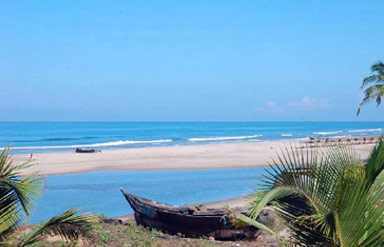 Arambol is every tourist’s dream beach because of its mesmerizing blend of sea, sun and sand. It is a pristine and secluded beach situated 50 km from Panaji in the North of Goa. This is among the most popular beaches of Goa known for its serene and scenic natural ambiences, which offers peace and tranquillity to tourists who come here from several parts of the globe. The Arambol Beach extends over 16 km and consists of two beaches. 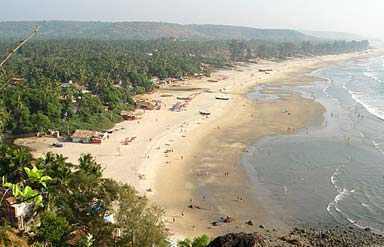 The popular one is the main beach known as Harmal beach, which is the northernmost beach in Goa. And the second one is the more picturesque beach which lies beyond the rocky headland. It can be reached on foot and is bordered by steep cliffs on both sides. This beach is famous for its mesmerizing blend of golden sand, azure sea and palm fringed bays. Along the scenic vista, this beach is also famous for its calmness and serenity. Large numbers of tourists who want to enjoy their solitude amidst scenic nature visit this place. It is a highly ranked destination of Goa where tourists can enjoy nature calmness and serenity. 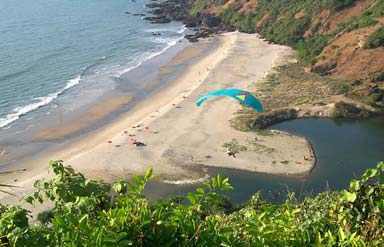 The rocky sea cliff of this place makes it a popular spot for paragliding. Apart from this, tourists can also enjoy dolphin watching. There is a hot spring found near the main beach which is another prime attraction here. This spring is believed to have healing effects on your skin, which calls on scores of tourists for bathing. The spring is lined with sulphurous mud, which is applied by tourists on their body for skin nourishment. Shopping around Arambol is a pleasurable affair as the beach is lined up with shops of several kinds. Tourists can choose from junk jewelry to clothes, handicrafts and many more. Arambol beach is one of those beaches in Goa, which do not have any beach resorts or beach hotels or beach huts nearby. However, there are few guesthouses, which provide accommodations to tourists during their Arambol tour. So, it is advisable to check in at some other place to visit the Arambol beach in Goa. 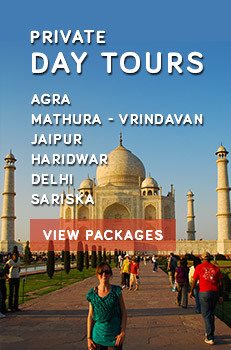 Caper Travel India offers a wide range of Tour Packages to Goa. For details about Goa Tour, please enter your query in the form provided below.